The ability to make fire is one of the essentials of survival. And having more than one way to make a fire is very good preparedness. It’s suggested that you have the ability to make a fire within 5 minutes. While a BIC type lighter won’t work reliably under all conditions, it is by far the simplest and quickest way to get a fire started. I try to keep one in my pocket for every day carry, just in case (and in my kits). It will perform better in cold weather if it was warm in your pocket. 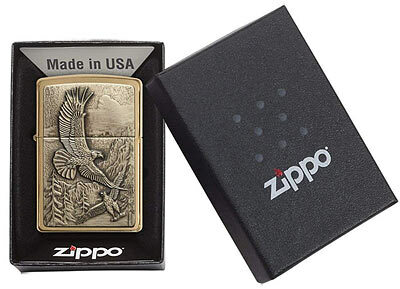 The Zippo is nice in that it can light up, burn for a while without melting. It can stand there without you holding it and it will stay lit. This frees up both hands for task. 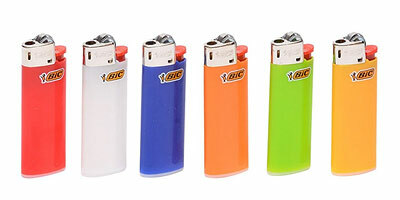 A plastic Bic type of lighter (though it has its uses) needs your thumb to always be on the valve to keep it lit. And it will melt, come apart after a min or so of being on. 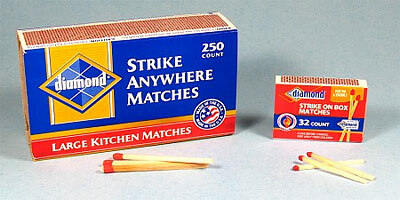 ‘Strike Anywhere’ matches are a great backup to a lighter. They’re even more effective starting a fire when bundling two or three of them together. Strike into a nice big flame. 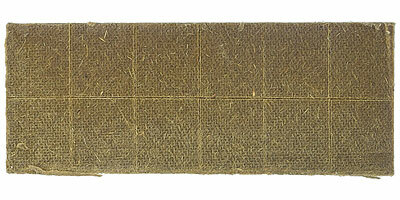 Keep them in a waterproof match box, like this one. 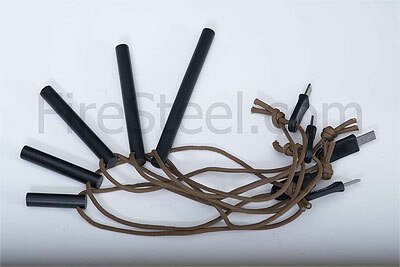 This incredible firesteel rod will shed gobs of sparks onto a pile of tinder while firmly scraping down its edge with the metal striker that comes with it, or your knife, etc..
Related: Survival Kit Paracord - How Much To Include Or Take With You? All different lengths and diameters. These are the best! Make a quarter size pile of magnesium shavings using the scraper on the magnesium portion of the bar (or a knife). Use the striker (or knife edge) to direct sparks from the flint onto the pile of shavings. Have tinder ready. This little candle will burn for several hours and could be lit first under wet conditions to help with a consistent flame to get a tinder / kindling pile burning. 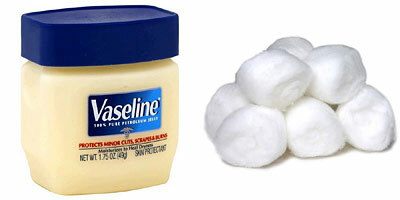 Simply smear some vaseline on a few cotton balls for a nice little ball of fire when lit. 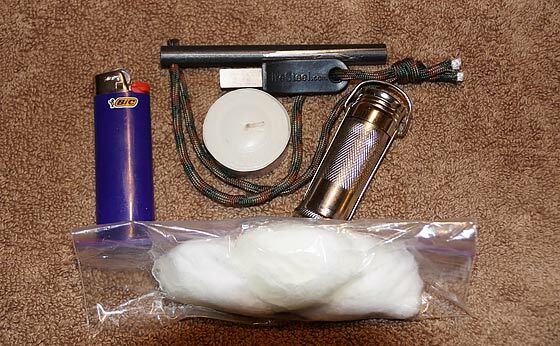 I keep pre-smeared cotton balls in a small sandwich bag (to keep the goo from getting on everything else) and I keep that bag within the Fire-starter kit Ziploc bag. 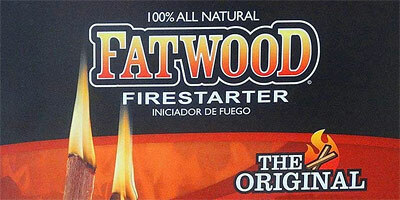 They sell various types and sizes of fire starter squares or pucks. Right now I have the ones pictured above. 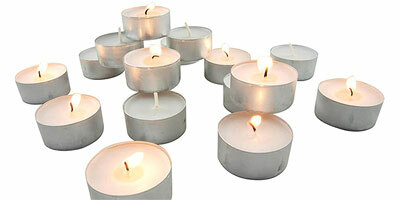 They’re recycled wood chips blended with wax. When lit they will burn for awhile, plenty of time to get some kindling going! 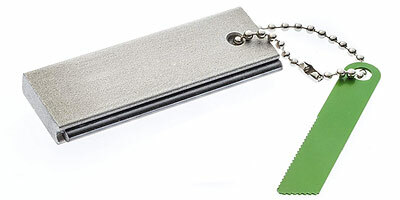 I keep a small flexible fresnel lens in my wallet at all times. If the sun is shining, I can probably make a fire with it. You could just as easily keep one in your kit, just like a magnifying glass. Don’t laugh, but a road flare is an excellent fire starter! 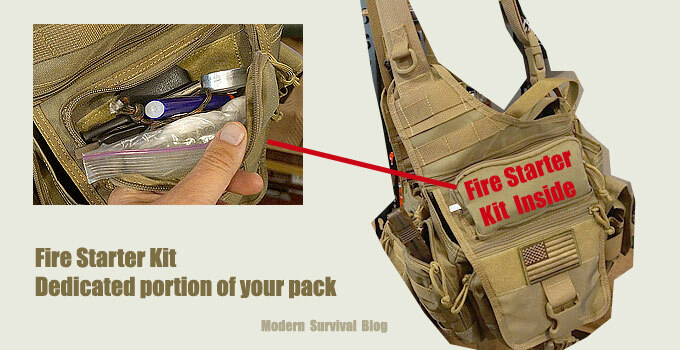 While it’s fairly large and won’t be practical for all kits, it WILL start a fire! When it’s so cold that your fingers don’t work, this could save your life. Starting fires with flints and burning metal chips all works under ideal conditions; in which case just use your Bic lighter. Emergency fire starting does not typically take place under ideal conditions! When you are so cold and wet your fingers don’t work anymore and your own thoughts betray you: You need a way to get a roaring fire burning when everything in your environment has been dampened by rain and fog for weeks on end. When the best tinder you can find is damp, you must sustain a flame for several minutes to ignite it. A paraffin candle on its side, dripping into your tinder has been successfully used since the days of the mountain men. I still carry one in my kit. 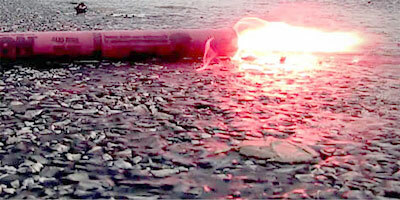 But I have found the standard road flare is the best bet now. If weight is a concern, break it off, down to 5 minutes worth. Keep the end with the striker and cap of course. 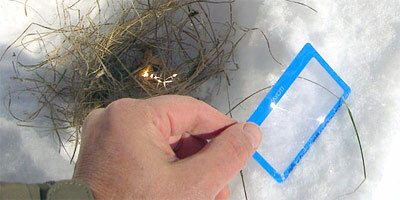 If it gets wet, light the striker end with your trusty Bic lighter or waterproof matches and you are still in business. The 3800 degree blasting flame will ignite the most stubborn tinder and in fact, you really don’t need tinder. Take it from me; all of the fire making scenarios pale in comparison to the misery of hypothermia setting in because you slipped crossing a creek, fell through the ice or simply because you have been rain soaked for days and are starting to wear out. Keep it simple!